Example of a map showing topography and rivers. National borders in black. 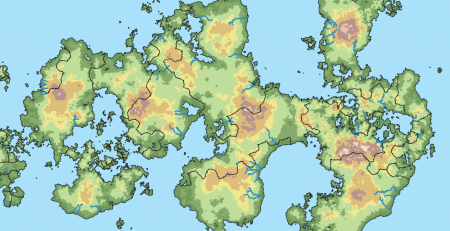 To make maps of fictional worlds feel more real, I think it’s important to address the physical nature of these pretend earths. So I’ve extend my algorithm and mapping system to generate and render rivers and topographical layers. National borders are in black on this screen, so for the rivers you’ll have to peek closer, as this is a view of an entire, large continent. 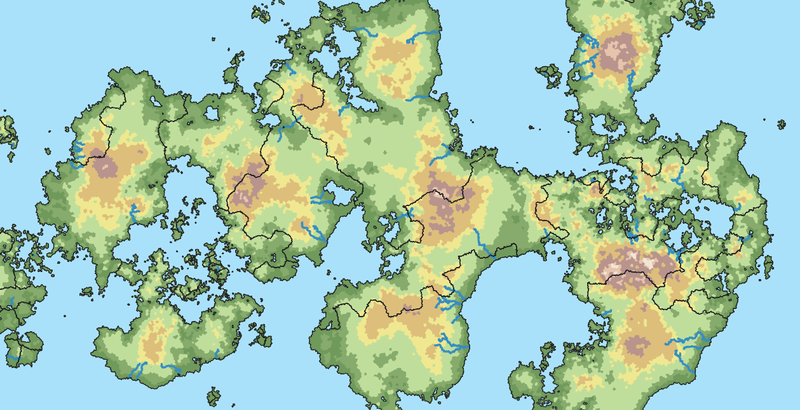 All in all the river generator needs a lot of improvement, but I think the topography is coming along nicely. I’ve also increased the size of the Voronoi mesh to 500,000 cells, and this has contributed significantly to making the maps more natural. Example of a random politician portrait. I think it’s important that you’re party’s politicians won’t just be a bunch of names in a table, so it’d be nice to put a face on them. I evaluated the option of commissioning hand-drawn art, but simple calculating the number of combinations and variations that I’m after (different ethnic looks, gender, age, …) would run this number into over a hundred, so that would become prohibitively expensive at this point. 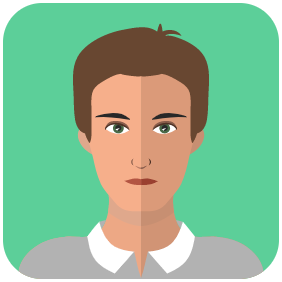 The current portrait generator combines assets I’ve purchased, with some hand-made assets and my own code, to generate a large amount of unique portraits. One problem I’ve yet to tackle is that of aging the portraits, as they all look like 25-year olds right now! 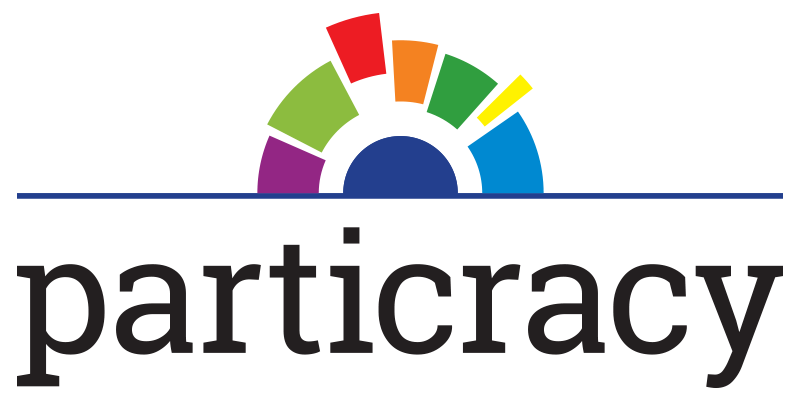 I’ve hinted in previous posts that there will be a system for running your party’s election campaign. Now, this won’t be as detailed as a full-on election simulator, because the scale of the game encompasses so many other things, and its pacing makes real-time tactical campaigning meaningless. 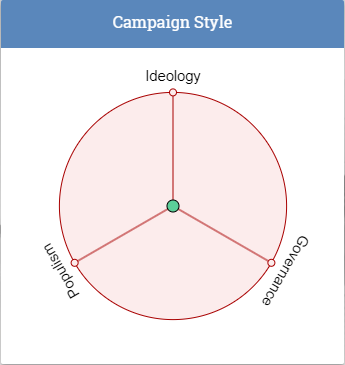 What it will allow, is for you to express the priorities of your party, and one of these tools is the “campaign style” diagram, where you pick the balance between the three basic tracks that allow you to win over voters: Ideology, Governance and Populism. The first will be about how well you match up ideologically with the electorate, the second about how you’ve done in government (or opposition, conversely) and how the virtual populace thinks they have fared, and the last will put more of a focus on what you do in your campaign and how your politicians come across. 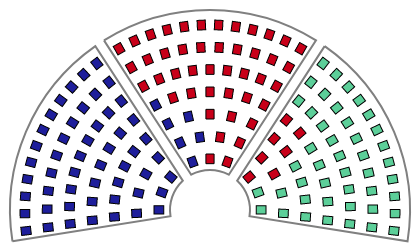 This is an example of the legislature seating charts you’ll be seeing in the game. I personally like this semi-realistic view more than Wikipedia’s rather abstract hemicycle-with-packed-billard-balls look. That’s it for now, I’ll try to get a more substantial post for the next time around! I can’t tell you how excited I am for this game! I love the map design and the politician portraits are a nice touch as well! I am currently playing the classic version and it is great as well, but I felt as if I was too late to make any significant changes to the history/continuity of the world. But now a new game will give me that chance! Great to hear you’re excited! The multi-world design of the new game isn’t just there to increase capacity (that is obviously the main reason), but also to allow fresh starts, like you describe. When i heard you were working on this again i was thrilled, looks amazing – keep up the good work, i’ll be playing religiously! Also, it’s a huge shame that you dont advertise this being created more – i play the classical version and i didn’t even know about it until today. You ought to get a twitter for it or something! Furthermore, while i’m awful at coding if there is anything else i could ever do to try and help development i’d be more than happy to. I do a degree in Pol & International Relations so i may be able to help with some stuff, never know. Hey, great to hear you’re interested in the game. I plan to advertise more when release comes closer, but right now I think I have at the very least six months of work ahead of me. We have an active discord channel (I’ll try to add a link to the blog here) that we use for development discussion, you could probably contribute there.